Can lightning strike twice? For decades, the circa-1925 Thunderbolt wooden roller coaster at Coney Island was one of the amusement area‘s (and the world’s) most beloved rides. A new-age successor opened in 2014 at Coney Island’s Luna Park. While it bears the same name, the steel Thunderbolt is an utterly different coaster from its namesake. It is one of the most visually striking thrill machines ever designed. Its ride, however, is just OK.
It’s not a mega-beast like Kingda Ka at New Jersey’s Six Flags Great Adventure or its ilk. But with its 90-degree lift hill and drop, multiple inversions, and perky 65 mph speed, it is clearly a ride for thrill enthusiasts. Thunderbolt is located a few blocks down from the legendary Cyclone. The two coasters bookend Coney Island’s famed boardwalk. Both are sights to behold. The classic woodie, which has graced the Brooklyn amusement shrine since 1927, is a living piece of Americana that ties Coney Island to its glorious past. Thunderbolt represents its rebirth and hope for the future. The long and remarkably thin tract of land on which the steel coaster sits stretches from Surf Avenue down to the boardwalk. It appears to be no more than 20 feet wide. 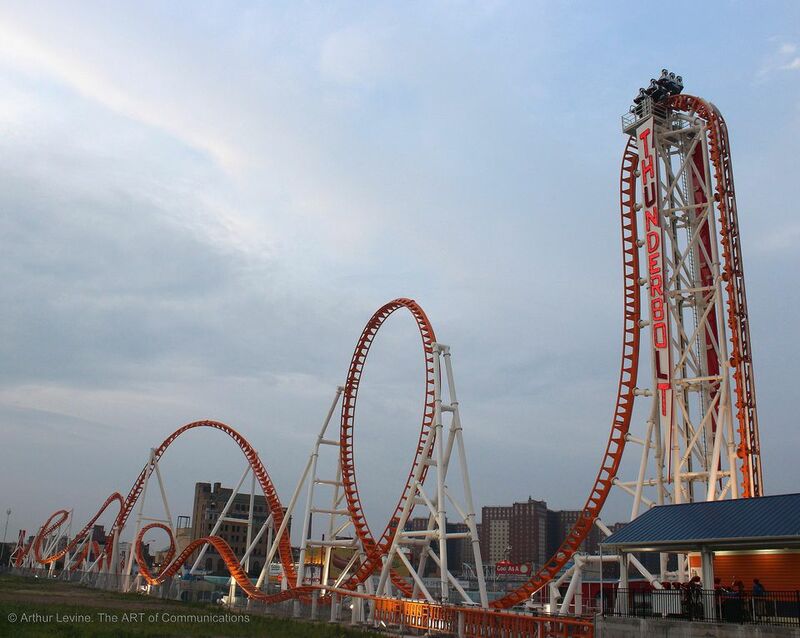 Its serpentine, electric-orange track pierces the oceanfront skyline. With its dramatic lighting, it is particularly beautiful at dusk. Its interplay with other landmarks offers a stark contrast between the old and new Coney Island. From one vantage point, for example, the ancient Parachute Jump structure can be seen framed within the coaster’s sleek, teardrop-shaped loop. The ride itself plays with the area's competing influences. Belying the structure's elegant, modern design, the signs identifying its name are wonderfully retro and evocative. The loading station is at the boardwalk end of the ride. Discounted multi-ticket packages, which can be used for the coaster as well as any of the other rides at Luna Park, are available. If Thunderbolt is all you are interested in, however, a-la-carte tickets cost a staggering $10 per person. At that price, it had better be one heckuva ride. Each train is a single nine-passenger car with three rows of three seats. As signs in the station make clear, riders cannot choose their seats (although you would think at $10 a pop, that would be a small concession the park could make). The front row, obviously, offers unobstructed views and is preferred, although the second and third rows are tiered like stadium seating. The exposed cars have no sides or backs. A Thunderbolt logo is attached to some minimal piping on the front of the cars. The ride uses a restraint system that I had not seen before. It incorporates an over-the-shoulder harness, but instead of heavily padded restraints, thin straps secure riders' upper torsos. Also, unlike most other coasters' over-the-shoulder systems, there are no head restraints. There are, however, unusual thigh restraints which secure the tops of riders' legs. The operators ratchet them down, which resulted in a bit of uncomfortable thigh crushing for me before the ride even began. After leaving the station, the train rounds a bend and heads straight up the vertical lift hill. (If the cost to board the ride hasn't already emptied your wallet, you'd probably want to leave it and any other valuables in your pockets with a non-riding buddy.) Like other 90-degree lifts, it's unnerving to face the heavens as you click-clack-click skyward. Looks Great. Ho Hum Ride. At the apex, there is nowhere to go but straight down the other side. That is immediately followed by a huge loop and a soaring heartline roll. The train races to the far end of its track, does a turnaround and navigates other elements, including a corkscrew and a dive loop that inverts passengers for a few disorienting seconds. “Disorienting” is the operative word. With all of the inversions, it was hard for us to get our bearings. We knew the ride would travel out to Surf Avenue and swing back towards the ocean, but we were not aware it had happened. The slightly rough ride also distracted us. Thankfully, with no head restraints, there was none of the ping-ponging head banging for which some coasters are infamous. Thunderbolt has some bunny hills on the return ride, which would typically deliver nice pops of airtime on other coasters. But, the heavily ratcheted thigh restraints on Thunderbolt prevents any appreciable out-of-your-seat moments (at least it did for us). The ride is mostly a blur, and it seems to end too quickly. It is neither a major disappointment, nor a hugely winning ride. But it makes a bold, dazzling statement along the boardwalk. And, as the first custom-designed coaster at Coney Island in decades, it is a welcome harbinger of great things to come.